An Indonesia transport safety investigator has said there is no data available that would confirm the theory of the AirAsia jet exploding before it hit the water – after earlier claims to the contrary. "There is no data to support that kind of theory," said Santoso Sayogo, an investigator at the National Transportation Safety Committee. Earlier, an Indonesian search and rescue official said that the AirAsia jet was likely to have exploded before hitting the water, judging by the wreckage. 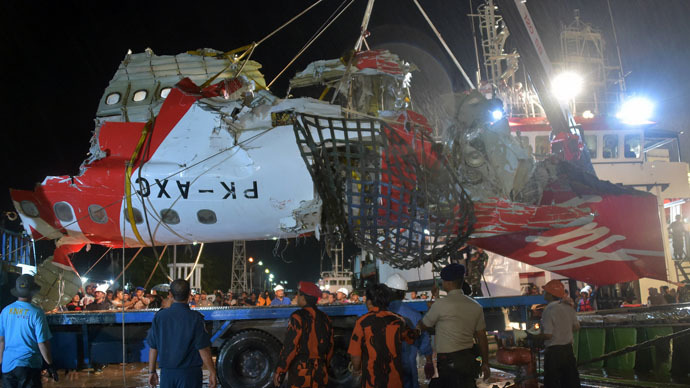 "My analysis is, based on the wreckage found and other findings, the plane experienced an explosion before it hit the water," Suyadi Bambang Supriyadi, operations coordinator at the National Search and Rescue Agency, told reporters. It comes after the plane’s two black boxes were discovered by search and rescue teams; one of them has been salvaged so far. "The download is easy, probably one day. But the reading is more difficult <...> could take two weeks to one month," the National Transportation Safety Committee head investigator, Mardjono Siswosuwarno, said, as quoted by Reuters. However, if the black boxes aren’t badly damaged, preliminary results may appear in two days. On Saturday, the tail section of the jet was salvaged. AirAsia flight QZ8501 crashed into the Java Sea on December 28, killing all 162 people on board. Forty-eight bodies have been recovered so far.